Adults, from left, pictured with Mrs. Lopez students are Charlie Riley, owner of Truckee Hometown Sears; Michael Gelbman, publisher of the Sierra Sun/North Lake Tahoe Bonanza; Hien Larson, principal of Alder Creek Middle School Principal; and Brienne Lopez, ACMS seventh-grade teacher. 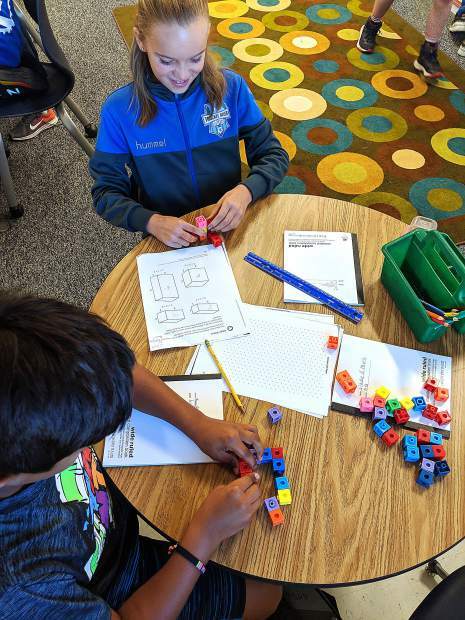 Now in its fourth year, the Truckee Hometown-SEARS/Sierra Sun Teacher of the Year program was created in 2011 to recognize the efforts of community teachers across Truckee, North Tahoe and Incline Village. Each year, teacher finalists are selected based on community nominations and spotlighted in the Sierra Sun and North Lake Tahoe Bonanza. In addition to Truckee Hometown-SEARS and the Sierra Sun, multiple community businesses sponsor the program and provide awards for finalists. Email truckeetahoteacheroftheyear@gmail.com">Bold">truckeetahoteacheroftheyear@gmail.com to learn more. 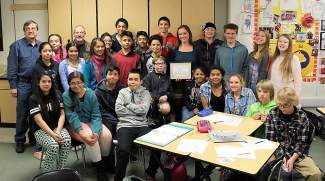 TRUCKEE, Calif. — The Truckee Hometown SEARS/Sierra Sun Teacher of the Year program has announced Alder Creek Middle School Teacher Brienne Lopez as its first 2014-15 finalist. On March 23, program sponsors Charlie Riley, owner of Truckee Hometown SEARS, and Michael Gelbman, publisher of the Sierra Sun/North Lake Tahoe Bonanza presented Lopez with an award certificate and gifts. Lopez was recognized for her ability to create a welcoming classroom environment and connect with her students. Brienne Lopez was born and raised in Truckee. After graduating high school, Lopez wanted to leave her small town community and try something new. She attended UC Berkeley and earned a bachelor’s degree in sociology. During college she gradually came to realize that she wanted to be a teacher. While working in Sacramento at a private tutoring center, she discovered that she belonged in a public school classroom. Lopez and her husband, also from Truckee, soon decided that their hometown was the right fit for them. Truckee had been a great place to grow up, with a very supporting community and it was where they wanted to raise their family. On her first day back in town, Lopez interviewed and was offered an aid position at the Community School. She later enrolled in the teaching credential program at Sierra Nevada College and ultimately earned credentials in Secondary Spanish and English Language Arts as well as a Multiple Subject and a BCLAD (Bilingual Cross-cultural Language and Academic Development) credential. Lopez went on to long-term sub before accepting a part-time, job share position at ACMS, teaching Spanish and English Language Development. Lopez is now in her 10th year teaching at ACMS, her third year full-time. She currently teaches seventh-grade Language Arts, Social Studies and English Language Development. Even as a veteran teacher, Lopez still finds she is learning. She has particularly enjoyed her new position in a content classroom, teaching Social Studies. She loves being able to tailor her class and content for English Learners and finding ways make them feel more empowered. “I love letting kids get lost in their learning, so much that they forget they are doing it,” said Lopez. Lopez’s dedication to her students doesn’t stop with the particular content they are learning — she tries to help them feel comfortable with who they are. ACMS principal Hien Larson confirms Lopez has accomplished this goal. English Language Learners who meet a grade requirement are rewarded with an activity each trimester, including a trip to a college campus. Students in the past have visited University of California and California State University campuses where they meet students from backgrounds similar to their own, who can serve as role models. Lopez has no immediate plans to change positions in the future. She is really happy where she is and enjoys working with dedicated and supportive colleagues.